The Mid-Eastern Athletic Conference (MEAC) announced its five members of the 2017 Hall of Fame Class and will take place on Thursday, March 9 at the Norfolk Scope Arena. The inductees will then be recognized that evening during the 2017 MEAC Basketball Tournament at the Norfolk Scope Arena. Among the five inductees is Hampton’s own, Francena McCorory. The Hampton, VA native is a three-time NCAA champion in the 400-meter dash and still holds two indoor and two outdoor school records. McCorory’s accomplishments elevated the status of the program and inspired it to reach new heights as evidenced by several current members of both Hampton’s men’s and women’s track teams. “I’m really happy for her. She is an amazing runner and a role model,” said sprinter Meshala Morton, a junior kinesiology major from Stafford, Virginia. During the 2015 season, Morton was named to the third Team All-MEAC in the 4×100-meter relay. Mid-distance runner Stanley Davis, a junior electrical engineering major from Glen Allen,Virginia, felt the wait was too long but well-deserved. “It’s been a long time coming. I’m glad she will finally be recognized in MEAC history,” the 2015 All-MEAC selection said. McCorory won her first MEAC title at the 2008 Outdoor Track and Field Championship, where she obtained the 400m title and women’s 4×400 relay. She then went on to win three-consecutive (2008, 2009, 2010) MEAC Outdoor Track and Field Championships in the 400m. McCorory holds the MEAC record in the 400m indoor (53.22) and outdoor (51.54), she won the 400m at the 2009 and 2010 NCAA Indoor Track and Field Championships and the 2010 Outdoor Championships. After competing at the 2010 NCAA Championships, she returned to her “Home By the Sea” an American record-holder, with a time of 50.54. 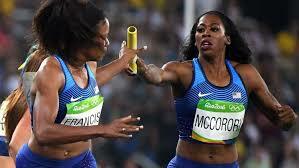 After McCorory graduated from Hampton University with a degree in Psychology, she received international recognition proceeding her gold medal performances at the 2012 London Olympics and the 2016 Rio Olympics as a member of the US 4×400 relay team. McCorory also won a gold medal in the 400m at the 2014 IAAF World Indoor Track and Field Championships. McCorory currently trains in Florida and, upon her retirement, she has high hopes of going after her dream of becoming a mortician. The list of 2017 inductees will also include Amber Jackson and Rashean Mathis of Bethune Cookman, Robert Porcher of South Carolina State and Tracy White of Howard. Jackson led the Lady Wildcats to three consecutive MEAC Softball Championships in the early 2000’s and holds numerous school records. She was selected in the second round by the Washington Glory in the National Pro Fastpitch (NPF) Draft, named Player of the Year in her rookie year and led her team to a victory at the Cowles Cup Championship. Jackson has been a head coach for the last three seasons at Delaware State University, where she won Coach of the Year in 2016. Mathis was a three-time All-MEAC First-Team honoree and the 2002 MEAC Defensive Player of the Year. Mathis holds a number of records for the Wildcats, including most interceptions in a career (31) and season (14). In 2003, he was drafted in the second round of the NFL Draft by his hometown team, the Jacksonville Jaguars. After having a successful 10 seasons with the Jaguars, he signed to the Detroit Lions. In 2016, Mathis was inducted into the Bethune-Cookman Hall of Fame. Porcher was named MEAC Defensive Player of the Year in 1991, selected to the All-MEAC First Team and earned NCAA Division I-AA Defensive Player of the Year honors by the NFL Draft Report. He made history when he became the first Bulldogs’ player to be drafted in the first round of the NFL Draft. He had a 13-year career with the Detroit Lions. After his NFL career, Porcher was active in the Detroit community, as he formed his foundation for cancer research and relief. White was a two-time MEAC Defensive Player of the Year (2000 and 2001) during his career with the Bisons. He led the team in tackles each season, becoming Howard’s all-time leader with 500 tackles. White played in the NFL for 10 seasons (2003-2012).